June 2, 2014: It only sounds like science fiction. To test a new technology for landing heavy payloads on Mars, NASA is about to drop a flying-saucer shaped vehicle from a helium balloon high above Earth's surface. The first launch opportunity for the Low Density Supersonic Decelerator (LDSD) is June 3rd at 8:30 a.m. HST, when the launch window opens at the U.S. Navy's Pacific Missile Range Facility in Kauai, Hawaii. Officials are calling it an "engineering shakeout flight." "The agency is moving forward and getting ready for Mars as part of NASA's Evolvable Mars campaign," says Michael Gazarik, associate administrator for Space Technology at NASA Headquarters in Washington. As NASA plans increasingly ambitious robotic missions to Mars, laying the groundwork for human science expeditions to come, missions will require larger and heavier spacecraft. The objective of the LDSD project is to see if the cutting-edge, rocket-powered test vehicle operates as it was designed -- in near-space at high Mach numbers. The way NASA's saucer climbs to test altitude is almost as distinctive as the test vehicle itself. "We use a helium balloon -- that, when fully inflated, would fit snugly into Pasadena's Rose Bowl -- to lift our vehicle to 120,000 feet," said Mark Adler, project manager for the Low Density Supersonic Decelerator at NASA's Jet Propulsion Laboratory. "From there we drop it for about one and a half seconds. After that, it's all about going higher and faster -- and then it's about putting on the brakes." A fraction of a second after dropping from the balloon, and a few feet below it, four small rocket motors will fire to spin up and gyroscopically stabilize the saucer. A half second later, a Star 48B long-nozzle, solid-fueled rocket engine will kick in with 17,500 pounds of thrust, sending the test vehicle to the edge of the stratosphere. 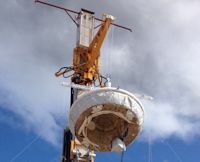 "Our goal is to get to an altitude and velocity which simulates the kind of environment one of our vehicles would encounter when it would fly in the Martian atmosphere," said Ian Clark, principal investigator of the LDSD project at JPL. "We top out at about 180,000 feet and Mach 4. Then, as we slow down to Mach 3.8, we deploy the first of two new atmospheric braking systems." "After years of imagination, engineering and hard work, we soon will get to see our Keiki o ka honua, our 'boy from Earth,' show us its stuff," says Adler. "If our flying saucer hits its speed and altitude targets, it will be a great day." The project management team decided also to fly two supersonic decelerator technologies that will be thoroughly tested during two more LDSD flight tests next year. If this year's test vehicle flies as expected, the LDSD team may get a treasure-trove of data on how the 6-meter supersonic inflatable aerodynamic decelerator (SIAD-R) and the supersonic parachute operate a full year ahead of schedule. The SIAD-R, essentially an inflatable doughnut that increases the vehicle's size and, as a result, its drag, is deployed at about Mach 3.8. It will quickly slow the vehicle to Mach 2.5 where the parachute, the largest supersonic parachute ever flown, first hits the supersonic flow. 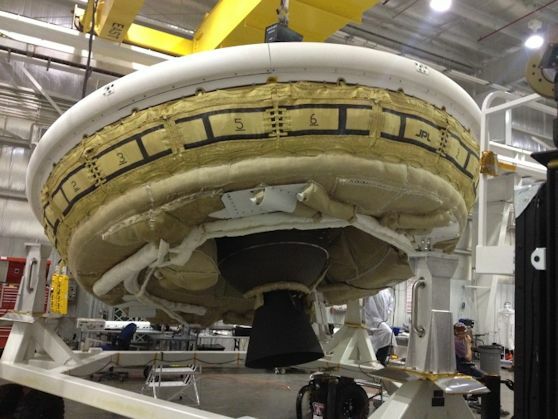 About 45 minutes later, the saucer is expected to make a controlled landing onto the Pacific Ocean off Hawaii. NASA's Space Technology Mission Directorate in Washington funds the LDSD mission, a cooperative effort led by JPL. NASA's Marshall Space Flight Center in Huntsville, Alabama, manages LDSD within the Technology Demonstration Mission Program Office. NASA's Wallops Flight Facility in Virginia is coordinating support with the Pacific Missile Range Facility and providing the balloon systems for the LDSD test.